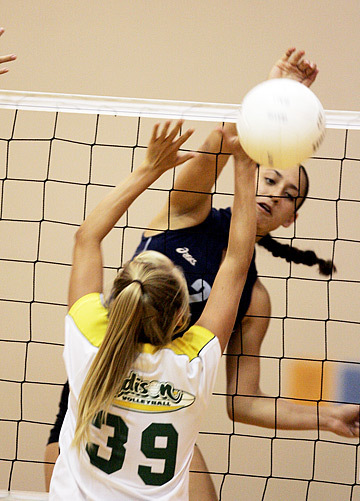 Moanalua's Brianna Amian hit a smash past Edison's Camryn Torromeo in a sweep yesterday. Senior Brianna Amian and junior Kaleinani Kabalis are expected to be one of the top hitting duos in the Oahu Interscholastic Association this season. But for now, the two are content with beating some of the best California has to offer. Amian hammered down a team-high 10 kills in Moanalua's opening match of the Ann Kang Invitational Tournament yesterday, and the Menehunes finished 6-2 in pool play to advance to today's double-elimination championship bracket at Iolani. Moanalua won its first six games, but had to shake off some early-game jitters before coming back to defeat Edison (Calif.) 25-18, 25-19 for their first two victories. "Our setters are new and we missed a lot of serves, but we managed to dig a lot of balls to keep ourselves in it," Moanalua coach Thomas Lake said. "Eventually we were able to get the ball to our big hitters and they came through." Amian was especially effective, mixing power shots with little roll shots as she finished each game with five kills, and was also key in keeping Edison's Kari Pestolesi in check. The 5-foot-11 senior whose parents starred for Hawaii and who has committed to play for UC Irvine next season, had just three kills. Pestolesi's father, Tom, played was all-league in 1982 and 1983 for UH and was a third-team All-American in 1983. Her mom, Diane Sebastian, was considered Dave Shoji's first "big-time" recruit. She was an AIAW All-American in 1978 and 1979 and an NCAA All-American in 1980 (the only year the NCAA named All-Americans). "This tournament gives us a chance to play against taller people, and sometimes we have to be a little more creative," Amian said. "We changed our defense around a little and it just forced us to block as best we can." Despite the size difference, Moanalua had three blocks compared to just one for the Chargers, and had twice as many kills. "You can't measure the value of all these early games, especially against the mainland teams," Lake said. "I'm definitely happy with how we are playing." Forced to play back-to-back games due to the structure of the tournament, the Menehunes turned right around and defeated Judge Memorial Catholic (Utah) 25-11, 25-16. They added two more wins against Word of Life before losing two games to three-time tournament champions Mira Costa (Calif.) in the afternoon. Today's championship round matches will begin at 6 p.m. The champs return: After taking a break from the tournament last year, Mira Costa made its return in dominating fashion yesterday, winning all eight games played. The Mustangs won the Invitational from 2002 to '04, but didn't make the trip to the islands last season in order to give most of the kids who play club volleyball all year a break. "A lot of the girls are always playing and we felt they needed to rest up for the regular season," Mustangs coach Daelea Aldrich said. "We have a lot of new kids on the team this year though and the seniors wanted to come back to Hawaii, so we're here." Talented outside hitter Alix Klineman, considered by most the best player in the country, leads the reigning CIF champions, but has plenty of help in the form of 6-foot-2 middle blocker Lauren Bledsoe, 5-foot-11 outside hitter Shelby Avol, and 6-foot-2 freshman Falyn Fonoimoana. "We have a lot of talent, and Alix is right there at the top," Aldrich said. "She's athletic, quick, intelligent, and can put the ball down on the court anywhere she wants to."